More than 250 dancers from NYC’s PMT Dance Studio crowded into the "TODAY" show plaza in midtown Manhattan on Tuesday, September 9. 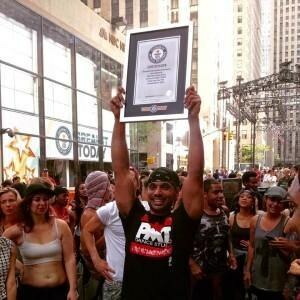 The task at hand: set the Guinness World Record for largest street-dance performance. The rules: At least 250 dancers had to dance a choreographed routine continuously for five minutes. 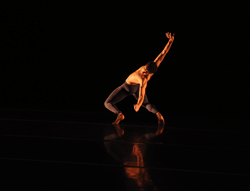 Choreographed and rehearsed by studio director Pavan Thimmaiah, the dance contained hip-hop, break dancing and funk elements and was performed in complete unison. Guinness World Record adjudicators carefully observed the dancers to make sure nobody stopped dancing. The verdict: Despite a couple disqualifications, 253 dancers performed for five minutes straight, setting the Guinness World Record for largest street-dance performance. Congratulations PMT! Check out their performance here. Pavan Thimmaiah holds up his Guinness World Record plaque. Photos courtesy of PMT Dance Studio.